Nothing stops the PlayStation 4 exclusive party, eh? God of War’s only just released, but Detroit: Become Human is now days away. Quantic Dream’s narrative adventures are always a subject of much division among the gaming community, but if you’ve enjoyed the likes of Heavy Rain and Beyond: Two Souls in the past, then we’re confident that you’ll be a big fan of this. The trailer doesn’t give away too much, although you’ll probably want to skip it if you’re on a media blackout as it includes footage of environments and characters that have never been revealed before. It’s a bit cheesy, but David Cage’s games tend to have that element to them anyway. Are you planning to embrace the android revolution this week? Whens the review embargo up? Really looking forward to this one, just hope it doesn't disappoints. Despite my very mixed opinion of Quantic Dream's work, I am very much looking forward to playing this. Mmmm just gimme the game now. Off work Friday as well. Call me old fashioned but I like a good linear story told well. I played the demo and didn't like the hybrid game/multiple storylines model. For me it ruins both the game and the story. The immersive element is irreparably broken by being put in a position of being shown the decision tree and wondering what would have happened if I had chosen differently. The mode is a great idea but not a good one. I'm giving this a miss. hmmm.. the embargo lifts the day before release? that's not like sony. many retailers will have shipped pre-orders before this. i'd still get it anyway, even if it got middling/marmite reviews. @playstation1995 lol what if this game get 75 on metacritic ? @leucocyte I think it's just because they got the gold masters late. Also, they're really trying to protect against spoilers. You don't have to be a fan of Heavy Rain and Beyond: Two Souls for this game, it's enough to be a big sci-fi nerd like myself. I mean, come on it's androids! It's like being in an Asimov book or a movie like 'I, Robot'. The premise alone is supercool, and if you add the rich characterizations and gameworlds of Heavy Rain or Two Worlds, that's even better. 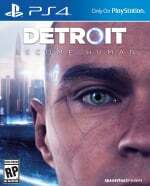 "yes I know the main characters in the game are robots"
"We're not computers, Sebastian, we're physical"
Day 1 if the reviews are good, I like QD supernatural and scifi story like indigo propechy more than realistic one like heavy rain. Finally played the demo. Still not 100% sold on the game because QD's past work has always come off as pretentious in writing and while people may say idiotic stuff like the new God of War or recent Naughty Dog games are 'interactive movies' the real 'interactive movies' are QD's games which are really just one big long QTE. Despite that, the setting of this game is cool. As a big fan of sci-fi the cyberpunk kind of feel this game has could pull me in even if the gameplay doesn't (and from the demo it does once again seem like a long QTE). I'll wait on reviews because I was also somewhat interested in Beyond: Two Souls before that released and it turned out to be very meh, but there is potential here. Key is managing expectations, this has the makings of a solid 8/10 if the developers get most things right but it's not going to be a Game of the Year contender alongside the likes of God of War, Red Dead Redemption 2 or even Monster Hunter World. Man, I was excited before but this launch trailer has increased my hype levels drastically.